Camtasia is really the best screen casting software around. Perfectly for making your online videos. You can record PowerPoint slide shows and software tutorials. 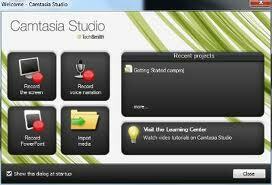 The program lets you record your screen and voice. An example of a video made with Camtasia is my video: How to create powerful videos for your website. I recorded this video wit Camtasia by connecting a USB microphone to my computer and showing a PowerPoint presentation on my screen.